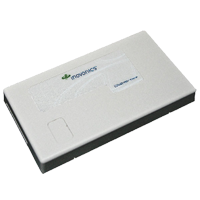 The wireless receiver is connected directly to the PalatiumCare® Server. Using proven Inovonics® EchoStream technology, the wireless receiver catches signals from resident and location devices and delivers them to the Server so that a caregiver can be notified. Power is required.